Our Australian partners have now released Mobile Data to the Apple Store and so Tracker Mobile is now officially available for the iPhone, iPod and iPad! 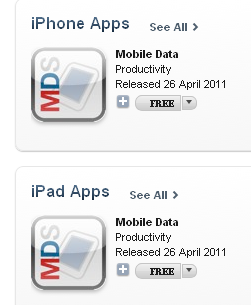 You can download the Mobile Data app straight onto your Apple device, straight from the store. If you need help to configure it, give us a call in the office. We're now the only asbestos surveying software to be available on Windows, Android and Apple phones and tablets - whatever device you want to use on site, we can support you. I'm about to start a Land's End to John O'Groats cycle for Cancer Research UK. You will know the good work that they do and you may know why this is such an important charity to me. My JustGiving page at http://www.justgiving.com/le2jog4cancerresearch explains all and I do hope you can help me to raise £1,000 for this cause. Thanks for reading and please donate if you can.